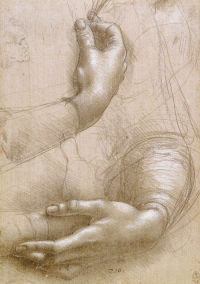 This life study of the hands and lower arms of a woman is a fine example of Leonardo’s fluid metalpoint technique. The artist appears to have begun by sketching both hands in an embrace across the waist of the figure. The position of the right hand has subsequently been rethought and redrawn at a higher point towards the centre of the chest. Once this new position was established, Leonardo proceeded to model both hands by the application of rapid diagonal, parallel hatching with the silverpoint itself and with a white liquid medium or gouache, in order to indicate areas of shadow and highlight on the hands, fingers and lower left sleeve. The drawing is thought to be associated with the portrait of Ginevra de’Benci, which was at some point cut down at the bottom edge, and may once have included the lower torso, arms and hands of the figure, as in the case of other female portraits by Leonardo, such as the Mona Lisa.